One of the Canadians at the Olympics this year is Canadian Crispin Duenas. He is a regular at the Toronto Public Archery Range and considered to be 17th in the world. But being in the top 20 in the world still gives him a decent shot at a medal. Some people just lose their cool during big competitions and archery is largely a mental sport. 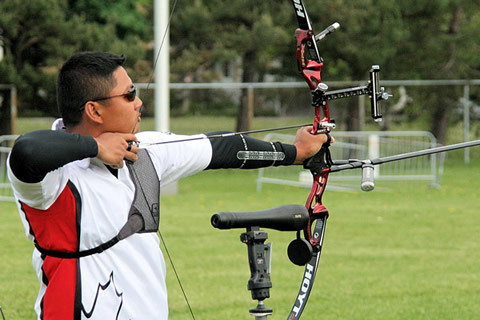 Crispin Duenas began doing archery and competing when he was relatively young. “I wanted something different to do and I had a fascination with Robin Hood as a young kid,” says Duenas, who was introduced to the sport by his Grade 8 math teacher at John A. Leslie Public School in Scarborough, Ontario. What also keeps Duenas going through practice sessions — including at his favourite outdoor range, the Toronto Public Archery Range, next to the Ontario Science Centre — is what he sees as archery’s biggest challenge: Exposing archery to the general public. He see's himself as an ambassador trying to showcase his sport to other Canadians. And while its true that Hollywood has done a better job of that lately (The Hunger Games, Brave, The Avengers, Game of Thrones, and the upcoming TV show: "Arrow"), the films alone won't get people out there trying out the sport. “I’m thinking things like The Hunger Games, (has) sparked interest into archery a little bit more and considering I’m one of the guys people like talking to, I always get the interview... ...I want to make archery known in Canada, I want to make it so that when you say “archery” and “Canada” people think of me and I think I’m well on my way to that now.” Its not ego either, he just wants to promote the sport and make it more prominent to Canadians. “For example, Canada’s already a hockey-dominant country, right? Why can’t we be archery-dominant?” he wonders. I think this urge to teach and encourage other archers is pretty common to the sport of archery. We know its not a common sport and even considered archaic (like discus throwing or javelin throwing). Because of the equipment costs its not a sport that is easy to get into either. Its a bit like hockey in Canada, a sport which only people who can afford all the equipment can get into. Being a dedicated archer isn't easy either. You're there 2 or 3 times per week battling the elements, heat, rain and wind (the weather doesn't effect your shot so much as it effects your mental condition), plus the exertion of pulling back the taut bow 200 times daily (which is essentially weightlifting). The mental challenge ends up being the biggest thing for archers. People can, through exercise and cross-training, prepare their bodies for the events, but the mental challenge is what separates the true archers from the amateurs. Duenas is back at the 2012 Summer Games in London having secured the one Canadian spot available through the national trials in Montreal held in May. Duenas, who plans to become a high school physics teacher and is now volunteering in the classroom of his former Grade 9 science teacher at Birchmount, also thinks his academic background helps his archery, especially when it comes to angles, biomechanics and kinetics. On Friday Crispin finished eighth of 64 archers in the men’s ranking round at the London Olympics. A strong early showing that will boost his chances of being in the top 3. 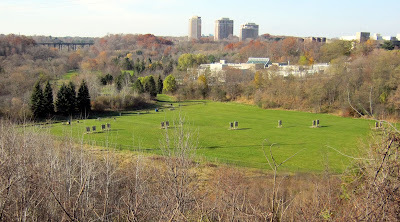 PERSONAL NOTE: Crispin was there at the Toronto Public Archery Range during an incident where an elderly man had heat stroke and we had to call an ambulance. His Life Guard training was very helpful. 8 Super Fun Exercises Anyone Can Do!